Imagine it’s your birthday. Your thoughtful partner got a bouquet of flowers delivered to your office just to put a smile on your face (cheesy, but it worked ;). You grab a vase, fill it with water and put the beautiful white roses in it. Five minutes later, your clumsy secretary walks in and knocks it off your desk. Your paper agenda is now completely drenched and ruined. Realistically, what can you do about that? Nothing. Consider your business officially disrupted since you no longer know which clients are coming in, when or why, and that, for the next day, month or even YEAR. Do you really want to take that risk? I know I certainly wouldn’t. The beauty of technology is that losing a piece of paper is not an issue anymore. You can store everything digitally in the cloud without the risk of ever losing it. An online scheduling platform can allow you to store over a thousand contact names or numbers, emails, notes, etc. Not only is it easy to continuously update, but you can also connect and sync it with other current applications, making your life ten times easier. That way, you don’t ever have to worry about losing your agenda, and consequently, clients! Are you a control freak? Do you have hundreds of thoughts flowing through your mind at the same time? Do you stack post-its on your paper agenda because you’re simply running out of space (paper on paper, kind of a waste...)? Surely, you must be getting tired of keeping up with your overcharged brain. And a paper agenda certainly isn’t helping your case. As a busy professional, it is easy to forget about daily tasks, as there are simply too many to keep up with. Why not let technology handle some of those tasks for you? As a kid, I used to dream of a robot handling more than a few things for me and now, that’s actually possible! An online scheduling app saves you both the time and energy of spending hours on the phone with a client wishing to reschedule, while continuously flipping and squinting through the pages of your paper agenda to try to find a spare-time slot. Let technology handle these issues by default and spend more time focusing on your profession instead! 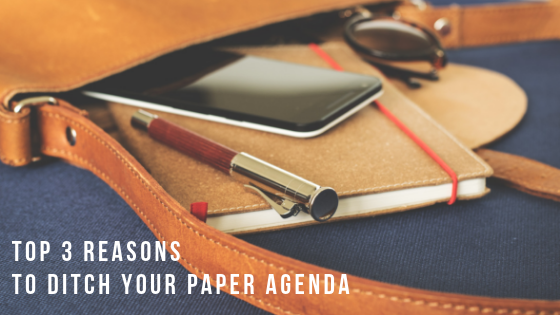 Unless your paper agenda is protected by a spell making it only possible for you to access it (Hogwarts is still fictional, sadly), you can say goodbye to a secure agenda. If you leave a paper agenda anywhere, anyone can access and flip through it. Not only does that put your privacy in danger, but it also endangers your clients’ privacy. Do you really want to lose clients simply because they are worried about their information being out in the open? With an online agenda, you can make sure it is properly secure by setting a required and strong password in order to access it. That way, you can rest easy and never worry about misplacing or losing your agenda. Simply put, if you don’t want to risk disrupting your business over a paper agenda, make sure to start storing everything in the cloud with the help of an online platform. Old fashioned at heart? If you’d still rather have a paper schedule on hand, there is always a way. With an online agenda, you can still print your schedule for the day, week, or even month!